Scientists from the University of Central Florida have created the first large-area metamaterial (cloaking material) for the visible-light spectral range*. UCF assistant professor Debashis Chanda and fellow optical and nanotech experts were able to achieve visible-light cloaking over a large area by using a multilayer 3-D open-mesh (fishnet) metamaterial to control the material’s refractive index** and thus control bending of light. 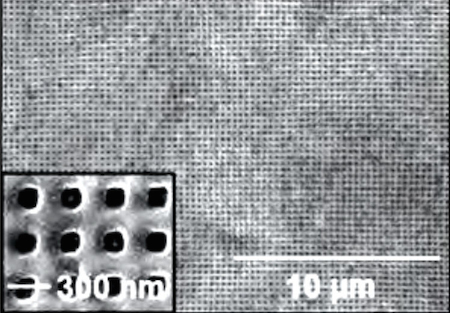 To create the material, they used a nanotransfer printing technique that creates metal/dielectric composite films. These are stacked in a 3-D architecture to achieve nanoscale patterns for operation in the visible spectral range. Control of electromagnetic resonances over the 3-D space by structural manipulation allows precise control over propagation of light. From a href="http://www.kurzweilai.net/how-to-create-a-large-area-visible-light-invisibility-cloak" target="_blank">Kurzweil AI.